An expert's tips for prenatal massage - is it safe and how do you even do it? Start by giving yourself a pat on the back (of the remedial, Swedish or shiatsu variety). Massaging your pregnant partner is a thoughtful way to earn brownie points while she continues miraculously growing your child. But a prenatal massage is a little different to the one you may have mastered up until now on your partner. There are actually a few key things to avoid, especially while she’s in her first trimester. 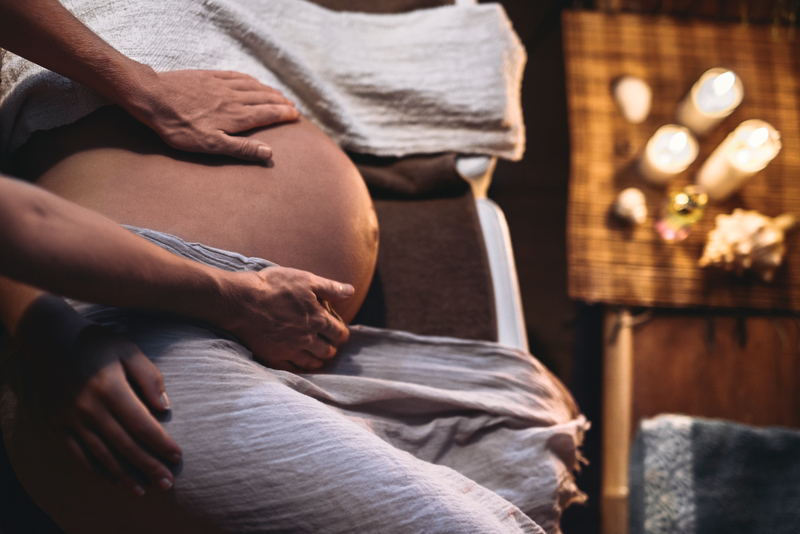 Here, Catherine McInerney -- remedial massage therapist and the founder of Pregnancy Massage Australia˚ (PMA) -- shares all the facts on pregnancy massage, as well as some helpful pointers for how you can give your partner a safe and relaxing massage during her pregnancy. What benefits can I brag about when giving her a prenatal massage? Plus, taking time to massage your partner can give you a chance to feel more involved and connected with the incredible things her body are achieving. What makes it different to a regular massage? There are the obvious differences - like the fact that you’re actually massaging two people instead of one (or more if she’s having a multiple birth!). Prenatal massage has a stillness in the approach and touch. While she might be used to a firmer touch, when massaging during pregnancy, keep things a little lighter. When should I avoid massaging her? If your partner is experiencing any bleeding, or the baby’s movement is reduced, a massage is off the table until they’ve seen their obstetrician or midwife. A good rule of thumb is to schedule your massages around her prenatal checkups with her specialist. That way, you’ll have the most up-to-date info about mum and bub’s health and whether it’s safe to crack open the oils. Do I massage the bump? Absolutely. Belly massage can help you both feel a connection to the baby, and can work some of the ligaments that are putting strain on the uterus. The back pain often experienced during pregnancy is caused by weakness through abdominals, so a gentle massage on the bump can ease some of the discomfort there. Is it safe to use oils? Yes - many essential oils are safe, while some, such as peppermint and clary sage should be avoided. But safety isn’t the only concern here. Check with your partner first before lathering her up in a scent that makes her nauseous. If you want a cheat sheet, Pregnancy Massage Australia have a range of oils for each trimester. How and where do I massage her? Put in a little prep and deck your massage space (aka your bed) with enough pillows to support her comfortably laying on her side. Support her with pillows between her legs, under her belly, and behind her head so she’s mirroring the fetal position of your bub inside her. Neck & scalp massage. Gently hold your hand over the back of her neck and apply soft circular movements using finger pads from the shoulders up the neck – you can continue circular movement into scalp. Back massage. Apply an open hand glide from the shoulders down, sweep over the hip and back to the shoulder. Apply a circular motion with your thumbs from her spine and over her erector spinae muscles. Slowly circle down the back from her shoulder to her hip and repeat – looking for any tight areas. Hip and buttocks massage. Less is best with pressure – start with a flat hand in a gliding motion from the lower back over the hip. This can be very sensitive for her, so pay attention to her feedback. Legs & feet massage. Start at the ankle or top of the foot and work your way up her leg to ease any swelling. Once you’ve got her on her side, have her bend her hips and knees. Place one hand at the top of the knee for support. With the other hand, hold the bottom of the foot and gently flex foot up with toes pointing to the knees. This will stretch the calf, and also pump away swelling in the legs and ankles. This one is great to do before sleep to ease cramping at night time. Arms massage. Using the web between your thumb and index finger, pump up her arm from her wrist to her shoulder to ease the swelling. If you’re still feeling unsure about giving her the right massage, call in the professionals. Pregnancy Massage Australia offer training for partners on how to massage expectant mums, or they can help to connect you with a specialist to do the massage for you.